Grooveshark, my favourite desktop PC music sharing service (I did not like the mobile version so much) has closed down. I just typed in the URL with the intention of putting on some music to drown out the sound of my beloved family (they are bathing and getting ready for bed, I am trying to write one final web page for a client) and lo and behold, it’s gone. I must admit, I did often wonder how they did what they did. In a digital world where every byte of data is copyrighted or trademarked by somebody, it amazed me that Grooveshark could stream, for free, without having to log in, just about any album or song that you could think of. As part of the settlement with some major music publishers, Grooveshark has agreed to shut down the website, wipe the servers and hand over all intellectual property, mobile apps, patents and copyright. In short, they are gone, finished, kaput. 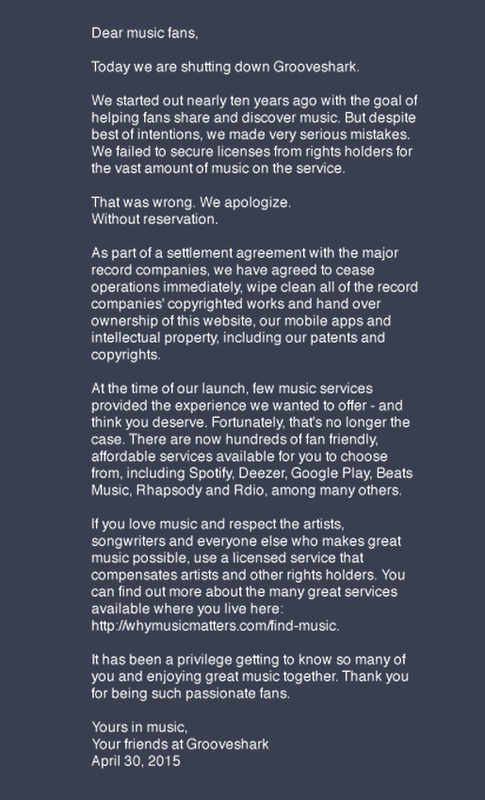 Farewell, Grooveshark, you will be sorely missed. I cannot believe that Grooveshark actually started nearly 10 years ago. I only discovered them a year or two ago. I had an account there, created a lot of playlists and used it to discover new music. I massively increased my interest in classical music because of Grooveshark, I discovered new folk music, rediscovered old blues legends that I had not listened to since the late 1980s and also listened to a lot of crap that I would not have been able to sample without Grooveshark (I am so glad I did not buy all those old Hawkwind albums – for years I wanted them but when I finally listened to them I was rather unimpressed! Grooveshark had some amazing sharing features too – they made it really easy to share playlists and songs on social media, you could even broadcast your own playlists for others to listen to (although I never really saw the point in this so did not bother).